“We just can’t go on in this way,” said South Africa’s President De Klerk three decades ago as the toils apartheid were bringing his country to its knees. After years of brutally segregating black and white people, De Klerk announced in 1990 that the system would be abandoned and political organisations which had opposed apartheid were unbanned. The decision ushered the way for multi-party elections and in 1994 Nelson Mandela – leader of the ANC – was elected the country’s first black president. “….there was no revolution because the black population of South Africa had never really wanted to destroy white South Africa. Instead they were more like spectators at Wimbledon watching the interplay of white politics over their heads, observing the relative luxury of white society and envying the superior schools, hospitals and other facilities enjoyed by whites. Inevitably what black people wanted was to be incorporated into that game on the basis of equality so that they too could enjoy a democratic political system and access or potential access to the desirable life which they saw white living”. South Africa was a very prosperous place in the 1960s and the first half of the 1970s as the economy boomed and apartheid was tolerated by many. But then a number of factors caused conditions in the country to collapse. Black Africans had suffered many years of racial oppression, but the government stipulating that some lessons in black schools should be taught in Afrikaner (deemed the language of the oppressors) was the final straw for many and classes were boycotted. In Soweto, students took to the streets on June 16th 1976 with placards to protest and headed to a mass rally at Orlando football stadium, but the unarmed crowd was greeted by tear gas and then fired on by police. Students retaliated by throwing stones and again the police fired bullets. Tragically, a 13-year-old boy called Hector Pieterson was killed (a black and white photo of his body covered in blood being carried by a friend and flanked by his sister was carried on the front pages of newspapers around the world). What happened in Soweto triggered violence to increase and it spread to other townships. Although the government did backtrack on the requirement for some lessons to be taught in Afrikaner in black school, at least 600 were left dead and another 4,000 wounded in violence which continued at some intensity until September. The two high schools from where the pupils of the June 16th uprising hailed were just a short distance from Mandela’s house (who was of course in prison at the time) in Vilakazi Street. 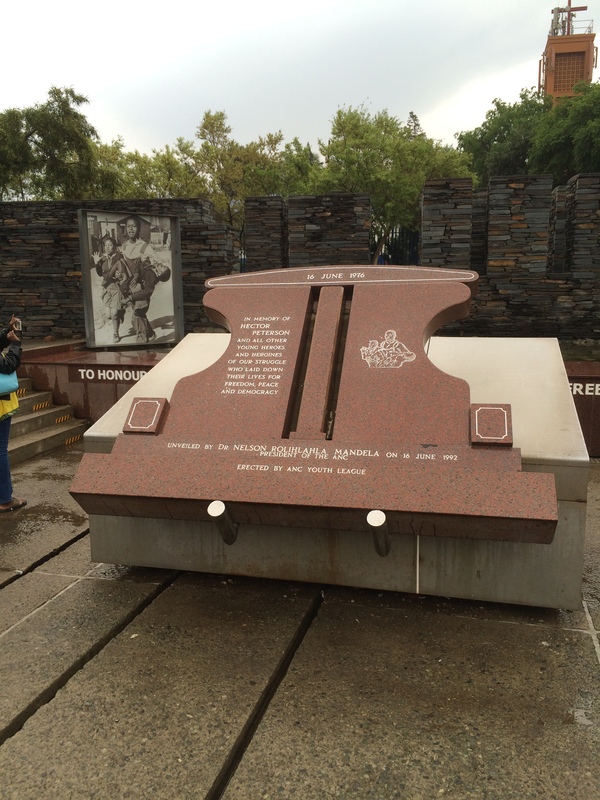 They are both still there and one has a memorial and museum dedicated to Pieterson and the others that died in the violence. The latter housed in a modern building is filled with large black and white photos capturing the scenes of bloodshed on that tragic day and powerful accounts on the walls from some of those caught up in the chaos. While the events that occurred in Soweto 1976 didn’t bring down the South African government, it was clear that things would never be the same again. There was a dip in investor confidence – the world took notice when protesting school children were fired upon by armed police – and the economy struggled in a way that it hadn’t since the 1930s depression. In the 1980s more and more Western countries joined the financial and economic boycott of the country, with big-name companies, such as Barclays – challenged by shareholders and consumers alike in Britain – withdrawing from the country. George W Bush (senior) told de Klerk in 1989 that if there wasn’t progress on releasing Nelson Mandela – who had been in prison with his comrades since 1964 – within six months he would extend US sanctions. And other countries, including France, put a ban on arm sales to South Africa. British consumers were called to boycott to South African goods and by 1988 the campaign was said to have attracted 29 million supporters. ANC members operating in exile – many who had fled the country after the Soweto Uprising – won the support of the Church of England and countries across the world started boycotting sporting events where South Africa had entered. By the time the Soviet Union collapsed in 1991, many nations no longer needed to back South Africa for taking its anti-communist stance. The country had become extremely isolated and so the abolishment of apartheid was inevitable. Nelson Mandela became an important symbol around the world of the struggle against the racist government and many honours and awards were granted in his name. He was moved off Robben Island in 1982 and spent the latter years of his imprisonment in more pleasant surroundings, but it was still prison. While de Klerk’s speech in 1990 was important, in reality apartheid wasn’t just abolished overnight – changes had been taking place over some time. Some “Non-whites” signs on everything from benches and separate counters in post offices had been coming down over a number of years. The announcement by de Klerk merely accelerated things. Following the 1994 election – in which 20 million people of all races stood in long queues to vote – the transition to a new government was largely peaceful (it was the four years before when things got pretty violent in South Africa). “Black people simply moved into the structures which they inherited from the old white regime, most of which remained intact,” writes Johnson. Mandela himself had high hopes for the new government. “We enter into a covenant that we shall build a society in which all South Africans, both black and white, will be able to walk tall, without fear in their hearts, assured of their inalienable right to human dignity – a rainbow nation at peace with itself and the world,” he said upon taking the oath of office in 1994. “Throw your weapons into the sea,” Mandela urged a mass rally in Durban in 1991. 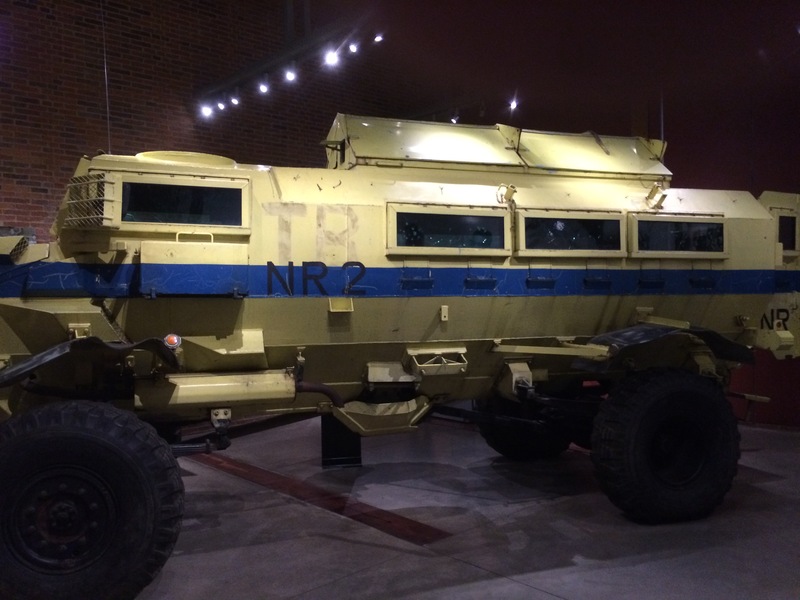 As a cage of guns on display at the Apartheid Museum symbolises, South Africa was awash with weapons after the fall of apartheid. I will discuss in my next blog, in the event, the biggest problem for South Africa in the last three decades has been black-on-black violence.